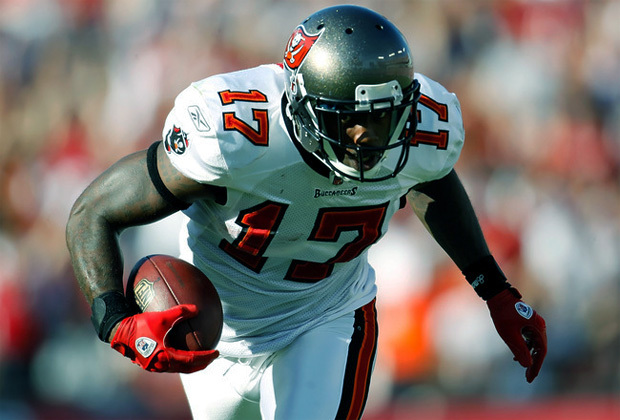 The Eagles have acquired wide receiver Arrelious Benn and a seventh-round pick from the Bucs in exchange for the Eagles sixth-round pick and a conditional pick in 2014. Benn (6-2, 220) was originally a second-round pick out of Illinois in 2010. In three NFL seasons he has 59 catches for 862 yards and five touchdowns. Benn also got a 15 carries for 44 yards. Chip Kelly likes versatility so it’s no wonder why the Eagles traded for Benn. Arrelious brings the Eagles a big body receiver they needed in the worst way. He is only 6-2 so don’t expect him to play like he’s 6-5, but every little bit helps. Benn does have a pretty big injury history, torn ACL in 2011, sprained MCL in 2012. These aren’t the kind of injury issues you want recurring in a skill position player or any player for that matter. Benn only played eight games last year before getting put on injured reserve, but Benn’s most productive season was 2011 when he caught 30 passes for 441 yards and three touchdowns. Benn does have an issue with drops, which will have to get ironed out if the Eagles ever hope to depend on him. Benn dropped eight of 38 catchable balls in 2011, which was the second-worst drop rate in the NFL. Benn is only 24 and has a previous history of success. He was a 5-star recruit coming out of high school, which lead to a very successful career at Illinois. As a sophomore, he caught 67 balls for 1,055 yards and three touchdowns; as well as 101 rushing yards and two touchdowns. What makes Benn really intriguing is his red-zone ability. Benn has nine catches for 66 yards and three touchdowns inside the opponents’ 20; which is more promising than anything Riley Cooper could hope for. But if there was one element of Benn’s game that really got Chip Kelly’s attention it was Benn’s blocking ability. Chip Kelly wants receivers who are willing to finish blocks because that really contributes to the outside running game. There is no telling yet how the acquisition of Arrelious Benn will affect other Eagle receivers. Most people seem to think it spells the end for Jason Avant who may not be a perfect fit for the prototypical Chip Kelly receiver. Benn does have experience playing in the slot WR position, which is probably enough reason to send Avant packing. Benn also has significant special-teams ability. He is a capable tackler in open space and also returned kicks last year. This jack of all trades fits like a glove on Chip Kelly’s team. Hopefully Benn can return to form after becoming an afterthought in the Bucs offense with the emergence of Mike Williams and the signing of Vincent Jackson. The Eagles need better play from their receivers especially in the redzone. Arrelious Benn may be a step in that direction. Hopefully there are more big body receivers to come. What do you think of the Eagles trade for Arrelious Benn? Does this mean Avant won’t be an Eagle for much longer?